Flying with Turkish Airlines again! 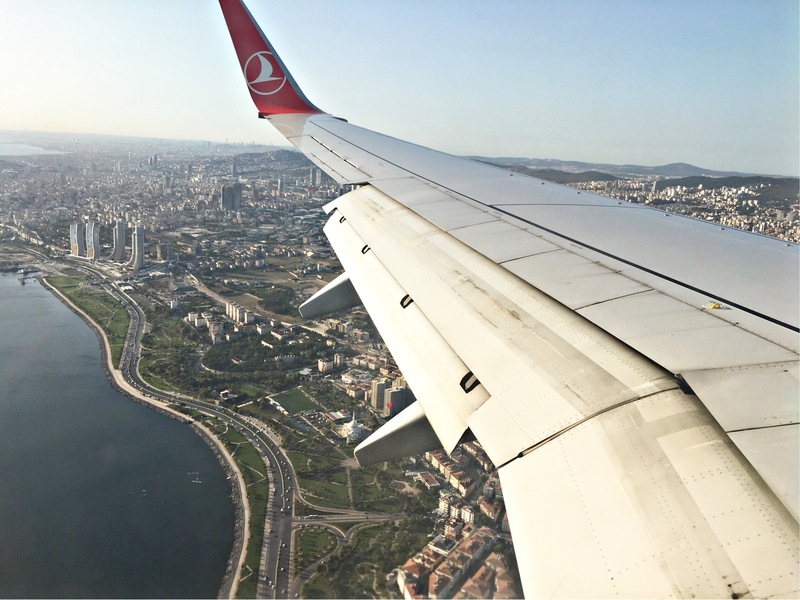 I flew with Turkish Airlines for the first time last year, and wrote a post about it on here (click HERE to read). We flew with them again last month and it was a little different, so I thought I’d do an updated post. Going out, we flew from Gatwick to Dalaman via Sabiha Gökçen airport in Istanbul, which I’d never been to before. 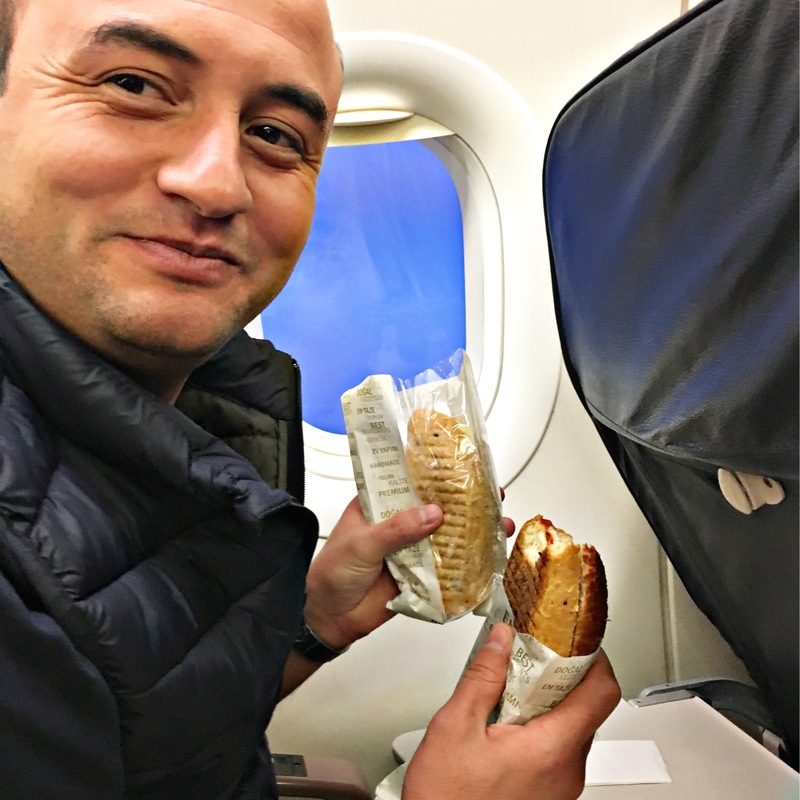 The previous 4 times I flew with them, the cabin crew came around with a small piece of Turkish delight and a menu, just after take off, but this time they didn’t – I think they must have stopped doing this now! The menu was handy as it told you the meal options in advance, rather than just waiting for them to come around with the trolley and having to make an on-the-spot decision! 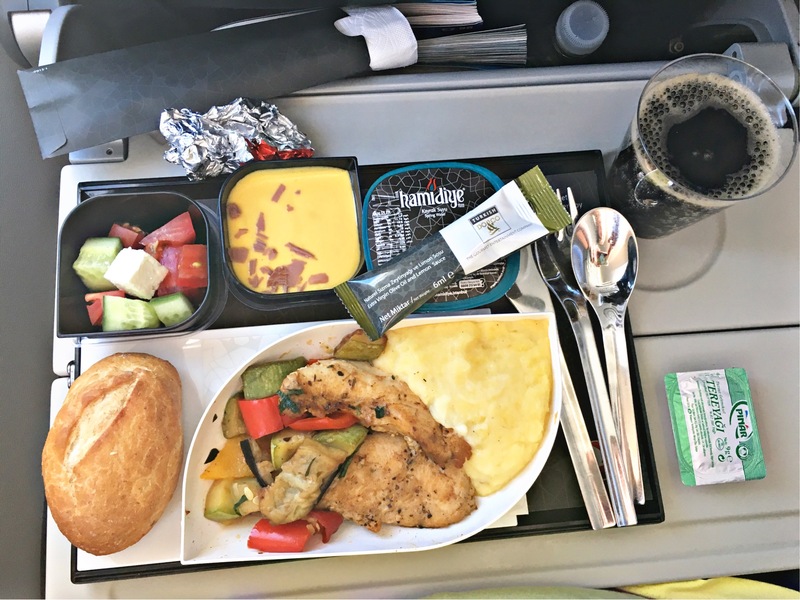 When they did come around, about 45 minutes into the flight, we got given the option of a meat dish or a pasta dish – I chose the meat. We had chicken, vegetables, mash, salad with feta cheese, tomato and cucumber and a bread roll with butter. Dessert was some kind of mousse, I think it was mango or something similar with chocolate flakes on top! We also had a little carton of water, and a drink of whatever we wanted, including alcohol! I love that you get a little sachet of olive oil for the salad, we all know how Turks love their olive oil, and salt, pepper and ‘real’ metal cutlery too – nothing worse than trying to cut meat with a plastic fork! 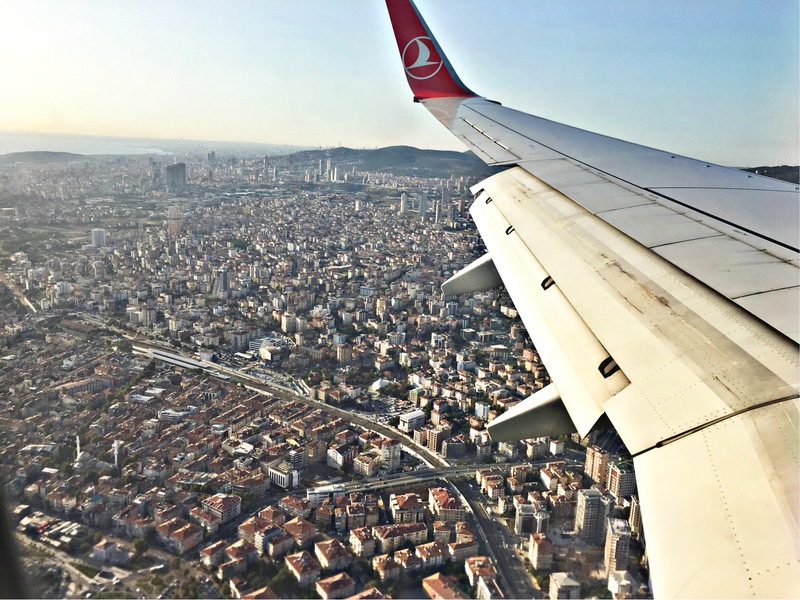 When we came in to land at Istanbul, the view of the city from the plane window was really interesting, the airport is so close to so many buildings, and there are some really fancy tower blocks too. All you can see when taking off/landing at Gatwick is fields, so it made a nice change! We had an hour and 25 minutes between flights, but our first one was delayed by around 30 minutes, so it was a bit tight! We walked down the steps off the plane and onto a waiting bus to take us to the terminal. There was a MASSIVE queue for passport control and we panicked a little as we only had an hour to get through, go to the international terminal, find the gate and board the plane. Luckily, there were airport staff directing people with domestic connecting flights to go through a fast track passport control desk and straight into the international terminal, without having to re-enter through security so that saved us a lot of time. After a quick wee, we checked the board, found our gate number, walked down to it and breathed a sigh of relief as we sat down in the seating area. We must have been sat down for less than 60 seconds when they announced that it was time for us all to go towards the desk and have our boarding passes checked, then taken onto another bus on the tarmac ready to take us to the plane! We got to walk up the steps to the plane which I always love doing, so much more fun than walking through the tunnel to board! This particular plane was different to any others I’d been on and had little footrests under the seats which I loved – really comfortable. By the time we sat down, the sun was just beginning to set outside, which made it feel like a really long day of travelling as we had left our house at 7.15 am that morning! 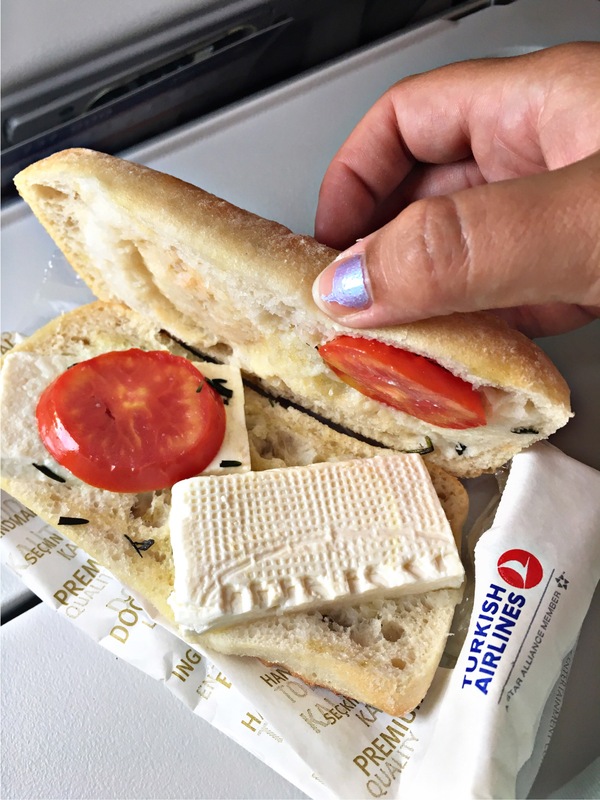 The flight from Istanbul to Dalaman is really quick, less than an hour, and almost straight after take off the cabin crew came around with some snacks. On the domestic flights you don’t get a full meal, just a snack, and no alcoholic drinks, just soft drinks or tea/coffee. 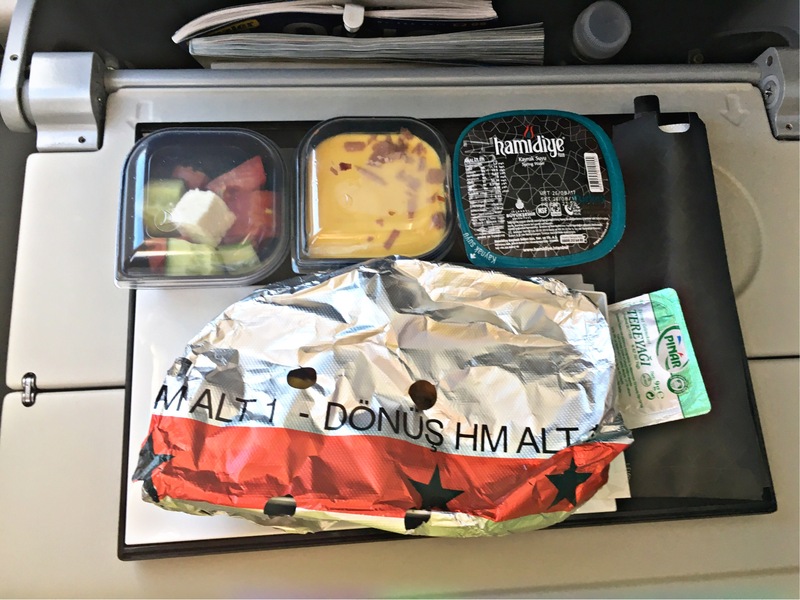 The last time I flew the food was given in a little paper tray and had a sandwich, pot of salad and dessert, but they have changed this, now it’s only a toastie or something similar. We had cheese, tomato and olive toasties. Berkay, being the growing man that he is, asked for two, and they gave them to him, he was very thrilled about this as you can tell! 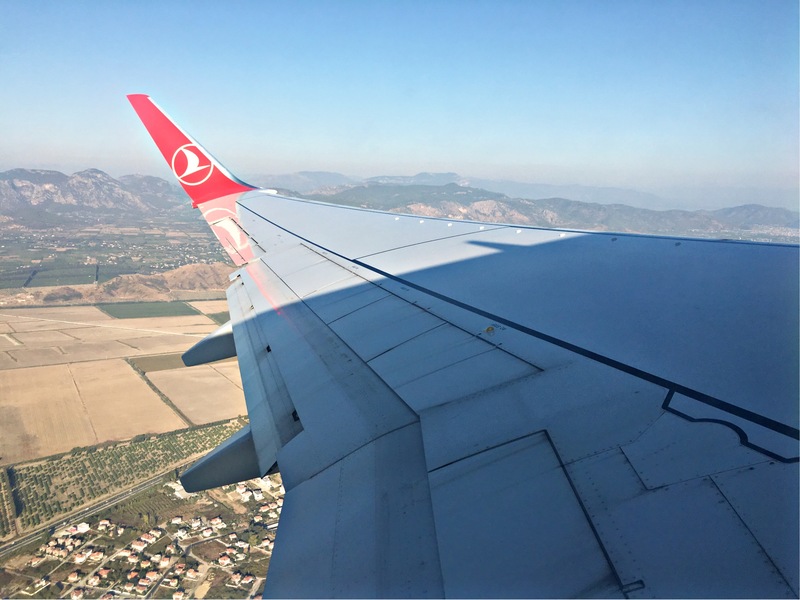 The domestic terminal at Dalaman is currently under construction so when we landed we were taken to a corner of the International airport through a door to collect our luggage from the carousel, then it was straight outside, down the ramp and into our transfer car to Calis! Fast forward two weeks and the inevitable journey back home again began. Of course the flights out to Turkey are always much more exciting than the flights back home again, right? 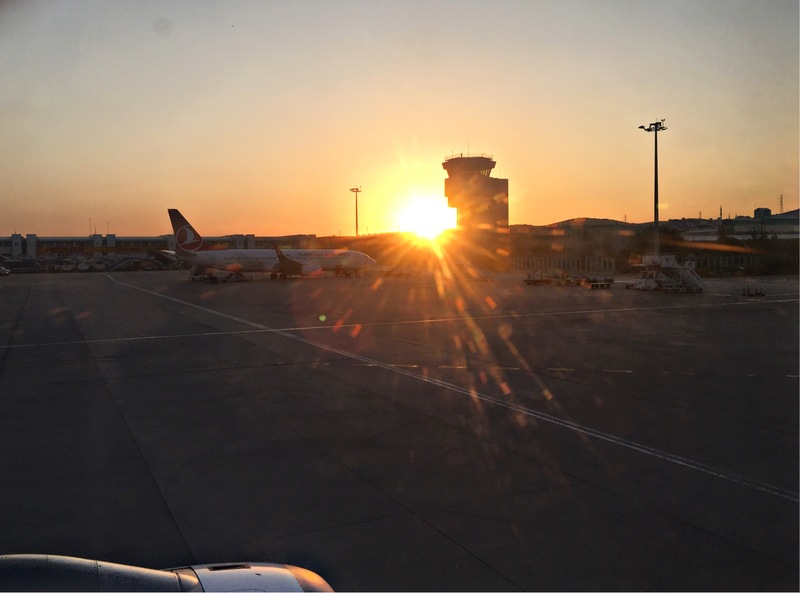 We had been awake since 5am for our 8.30am flight, and although the excitement of going on holiday keeps you wide awake on the way out, when you’re tired on the flight home and facing the reality of going back to work the next day it’s not quite as fun! 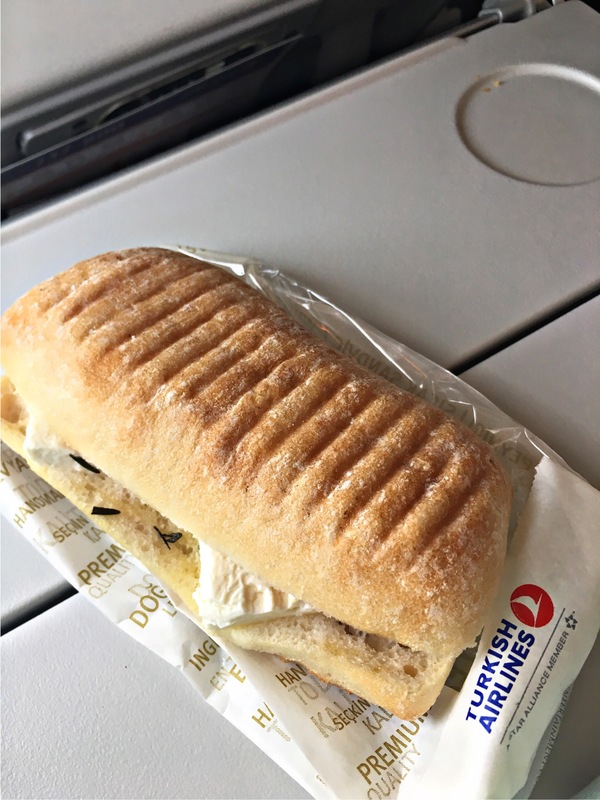 With one last glance down at Dalaman, the plane soared up to 30,000 ft and we waited for our in-flight breakfast snack – a cheese and tomato panini! As soon as we had finished that, it was time to land in Istanbul again, this time at Atatürk Airport. We had longer between flights this time – almost 4 hours to wait, so we actually left the airport for an hour and hopped in a taxi to a local shopping mall. On our return to the airport, we went through security, passport control, one more security with full body scanners, then through to Duty Free. When we checked the departure boards, our gate number was already up so we found that and had our boarding passes and passports checked not one, not two, but three times, and Berkay had his hand luggage thoroughly searched in a spot-check too! The security there is really good, but I suppose it’s expected. 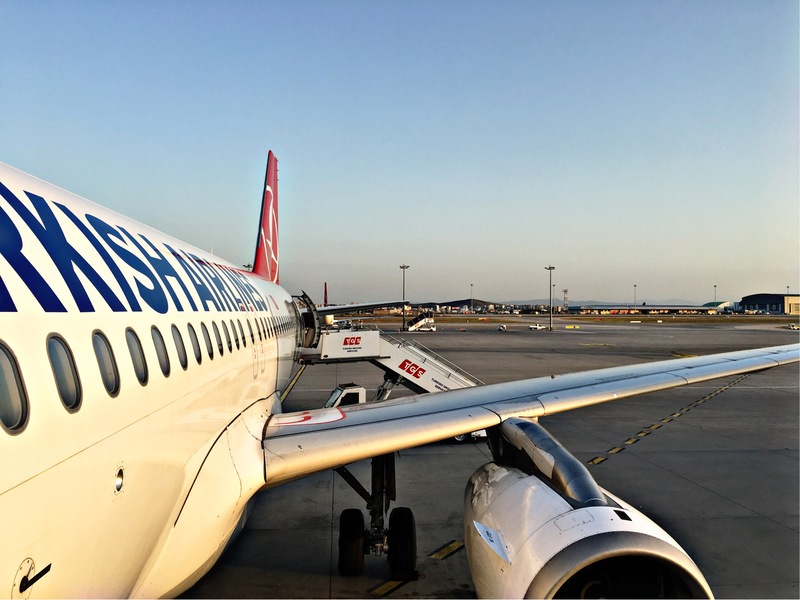 We didn’t have to wait too long before boarding once again, and Berkay had his last sniff of Turkish air before stepping on the plane. The meal on the flight home was again a choice of a meat or pasta dish. We had kofte (meatballs), rice, vegetables, cacik (yogurt with cucumber), a bread roll and a chocolate mousse for dessert. Other than the food, my favourite things about Turkish Airlines are the personal entertainment touch screens on the back of all the seats. They have lots of games, music and films on them, including some films not even released on DVD yet! The ones on the plane home even had USB ports so you could charge your phone through them, really handy! I’m a big kid and can’t travel without a a bear, I always get him out on the plane as you can see! By the time I had watched a film and had a sleep, making the most of the empty seat one side of me, the Captain announced it was time to descend into Gatwick, right back to down to earth with a bump, literally! Overall I love flying with Turkish Airlines, and this time they were actually cheaper than Easy Jet, Thomas Cook etc with the added bonus of 23kg hold luggage included, 8kg hand luggage and the free food and drinks. The only downside is the waiting time between flights but I think it’s well worth it! Beautiful post, it’s true that no other airline can beat THY . Unless you’re flying long distance like USA, Canada etc. By the way i hope holiday romance will keep blossom for you too. ← A Surprise Visit & Post Holiday Blues?